Posted on May 26, 2015 by Hawaii's Local Buzz. 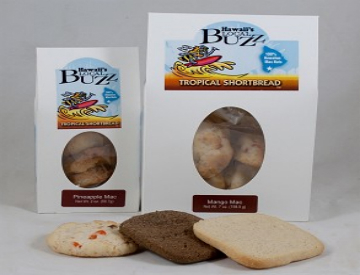 If a trip to Hawaii just isn’t in the cards this year, we have the perfect suggestion for creating a little tropical adventure in your own home: enjoy a package of tropical shortbread cookies from Hawaii’s Local Buzz! Made with tropical ingredients like pineapple and macadamia nuts, every bite will remind you of the warm island breeze and shady palm trees. Our tropical shortbread cookies, just like all of our artisan foods from Hawaii, are made in small batches, so every one comes out perfectly. The cookies truly melt in your mouth, as they are made with real butter. Enjoy your cookies with a tropical cocktail while sitting out by the pool or with a glass of iced 100% Hawaiian Ka’u Coffee. You’ll be almost as comfortable as you would be on a real Hawaiian beach. Make sure you put on your Hawaiian shirt and a lei to really set the mood during your tropical stay-cation, and of course, invite a few friends over to join you. Should you find time in your schedule to visit Hawaii this summer, we would love to see you at Paradise Meadows Orchard & Bee Farm, the home of Hawaii’s Local Buzz. We’re located on the Big Island, and we have a farm stand where you can try samples of our delicious, artisan foods from Hawaii. We also offer free farm tours, where you can learn more about our organic farming practices and efforts to honor the Hawaiian land. Visit out website for more information, or to order a package of cookies for your at-home tropical adventure.